----The Columbia River is 1,200 miles long, one of the largest rivers flowing into the Pacific Ocean from the two American continents. This tale is about our scouting, by land, of the first 600 miles of the Columbia. 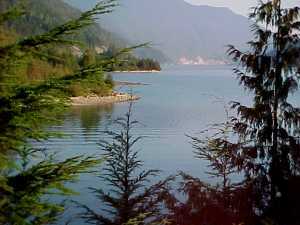 -----We swung gently on the hook in Parks Bay, on the southwest coast of Shaw Island. We were almost in the middle of Washington's beautiful San Juan Islands. The sun was slowly setting through the trees streaking the air and water with orange and red shafts of color. The light air sent fingers of ripples across the otherwise glassy water. We sat in Halcyon's cockpit, sipping wine and eating cheese, watching the drama of sundown. The ancient Greeks would have placed us in the lap of Dionysus, the god of fluid boundaries who gave man the gift of wine. He could slip with ease between the wildness of our setting and the domestication of our floating home. He personified the contrast between the apparent stability of our home, drifting on a surface that could, with a mere blow of wind, be chaotic. -----Bill broke the Dionysian spell. "Time to think ahead, El. What would you like to do this winter, next spring - even next summer?" The Greeks would have understood: these were words from Apollo, the god of order and distinct boundaries. Apollo was a god of light, Dionysus of dark - so it was natural that dusk would bring forth both in Parks Bay. -----El, the Dionysian, loves spontaneity, serendipity, a little chaos. "Oh, dunno - how about the Columbia River? We're out here in the northwest and have never been on the Columbia. Let's check it out." -----Suddenly, she froze, staring farther into the bay. "Look - that seal is making golden circles in the water." Dionysus reclaimed the bay. -----Bill, the Apollonian, in the days that followed, began reading and studying the Columbia on the Internet, in books, and on charts. It is not an easy river to figure out. One book, by a man who canoed the length of the river, was most helpful. Bill took notes and marked on his newly-acquired charts; El read the story for its enjoyment and beautiful descriptions - for "the feel of the river." -----Combined, this is a tale of what we discovered. The Native Americans, who knew the river best, called it 'Nchiawana, the Mighty River. It rises, from glacial melt, high in the Canadian Rockies. -----The mountain streams foam down through boreal forests to its collected beginning in Lake Columbia. It then flows to the north through the Rocky Mountain Trench, enclosed by lofty glacial-carved mountains. At the Big Bend, it finds a break through the western wall and flows southerly into sere desert lands. For a while, the river even flows to the east, but, finally, it settles on a westerly course out of the desert through a rain forest to the sea.This confusing path hid its source from European explorers for years. Finally, the British mapmaker, David Thompson, in 1811, traced its tortuous course from high in the Rockies to the sea. 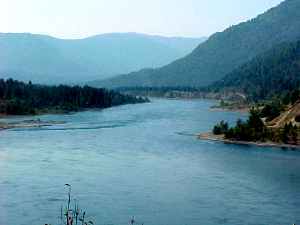 -----Some of the tributaries of the river are major rivers themselves: the Willamette, the Snake, the Pend Oreille, and the Kootenay. We can attest to their length and the power of these tributaries. We canoed a week on the Willamette and ran over the top of a 6-foot dam on the Snake. Thompson had to choose which of all these branching rivers he would call the mainstream Columbia. He chose the one with the greatest volume of water, even though the course of the Snake is considerably longer. -----Of the 1,200 miles of Thompson's river, 800 miles are now impounded behind fourteen dams, half of which have no locks. 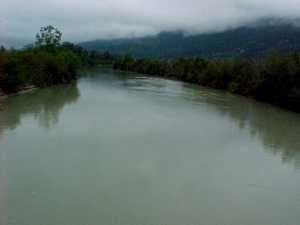 The remaining 400 miles of free flowing river are at the beginning, the end, and two stretches in the middle. 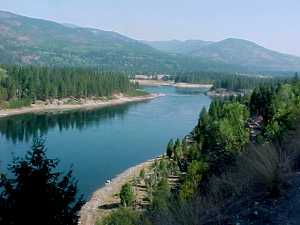 -----Most boaters, who know the Columbia, are familiar only with the 450 miles of navigable river that extends 136 miles down the Snake River, from Lewiston to the mainstream Columbia and the 314 miles from there to the sea. Along this reach, eight dams block the river but all have locks. This navigable portion is only a little more than a third of the entire river. 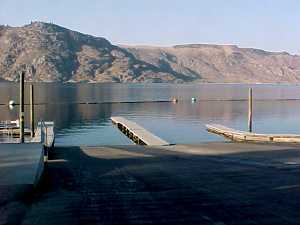 -----Northwest boaters often visit Lake Roosevelt, impounded behind lock-less Grand Coulee Dam. If one includes the 135 miles of the lake, with the 450 miles of navigable river, the total constitutes only half the length of the Mighty River. The rest is a bit of a mystery for most boaters. -----The Rocky Mountain Trench is a great fault-bounded trough that extends northwesterly 1,000 miles from Montana to Yukon. 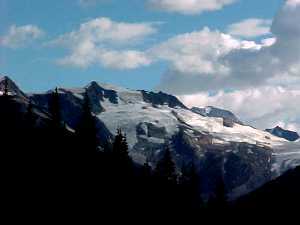 Glacier-capped mountains line the trench in British Columbia. Icy waters of glacier melt pour down the flanks of the mountains into Lake Columbia. The waters, thus collected, flow northwesterly from the lake, following the axis of the Trench. The stream wanders through a broad valley, slowing behind beaver dams and meandering through swamps. It pauses at Windermere Lake. -----The fertile valley is farmland, hacked from the northern forests. Hot springs here and there are home to tourists and golfers. The flat, meandering stream, almost haphazardly, wanders into trouble at the north end of the valley - Redgrave Canyon. Here it is sandwiched between rock walls and plunges through rapids into Kinbasket Lake. This is where civilization ends. 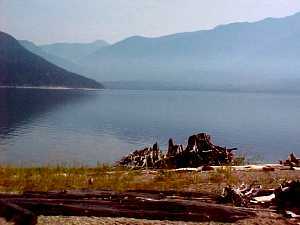 -----We asked folks in Golden about the lake that lay only a few miles to the north of town. Most answered our questions about the Kinbasket Lake with a simple reply, "Never been there," or "The winds on the lake are killers." "Water level always up and down, impossible," or "Stumps everywhere, whole forests underwater." 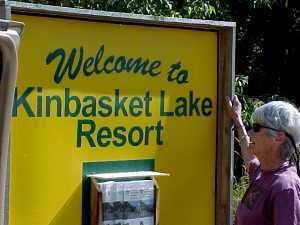 -----As we drove north from town, we saw a sign, "Kinbasket Lake Resort." Ah hah! Surely, they would have information about boating. Where the rutted, washboard dirt road turned off from the blacktop, there was another sign complete with brochures. "The description talks about a boat launch and a marina," El said. "We've hit the gold mine." -----Twenty minutes later, down a steep rough road, we arrived at the "resort." We asked the lady in charge about the lake. "Don't know anything about it," she said. "Interested in a room for the night?" -----We explained that we were just trying to gather information about boating. "Oh, then. That guy coming up the hill knows more than anybody." -----We asked 'that guy' and all he could tell us was that the water was highest in July and the rest of the year, at this end of the lake, there was no water - just the Columbia flowing through its original channel. "They store the water for you folks in the US. 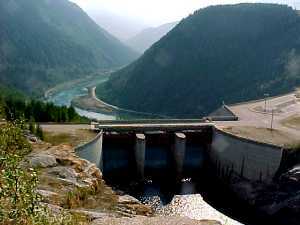 All winter, when the river flow would be low, BC Hydro runs the water through Mica Dam whenever they need to generate power down in the States. In spring runoff, when there's plenty of water, they shut down the dam and hold back all they can until it reaches full, usually in July or August. We run our quads and snow machines all over the place in winter - the water's gone." -----"How about ramps?" El asked. ----- "All high and dry this year. No snow and no water. Can't get in now. No way of knowing about next year." -----Lake Kinbasket is wild and beautiful. Bears, Black and Grizzly both, walk its shores. The howl of wolves echoes over its waters. No paved road reaches its shores. These are the wilderness headwaters of the Mighty River. This much we knew and it made us persistent in our search. 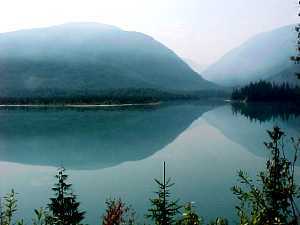 -----The main part of the lake fills the northwest-southeast trending Rocky Mountain Trench. Halfway up the lake, the western wall of the Trench is broken and offset by a rock-shattering fault that transects the Selkirk Mountains. The Columbia River, finding weakness in the rupture, turned southerly in a more-than-right angle bend. -----Mica Dam plugs the break in the western wall with North America's tallest earth-filled dam (650 feet high). Thus, the lake has three major arms - two following the Trench and one aligned with the crosscutting fault. The photograph above shows the three arms. -----These arms create the most hazardous aspect of boating the lake, since sporadic sudden winds often blast down or into one of the long arms. The winds plunge down the high mountain flanks of the trench or funnel into the prongs from storm fronts. In August 1982, a group of Boy Scouts in canoes was struck by a sudden wind as they crossed one of the arms. The canoes capsized and hypothermia slowly shut down their bodies. Four 13-year-old boys and two of their leaders drowned. 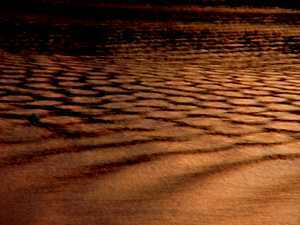 -----The surface area of Lake Kinbasket is smaller than Lake Roosevelt, behind Grand Coulee Dam, but Kinbasket contains the most water - 20 million acre-feet of water in a lake, at its deepest, over 400-feet deep. It is indeed regulated by US demand for water in the summer and fall and does reach maximum height in summer. ----- Logging slash has been dumped into the lake, and floating branches and even whole trees are another hazard to potential boaters. There are no marinas or fuel points on the lake. We could find no charts for the lake, although topographic maps would be helpful. 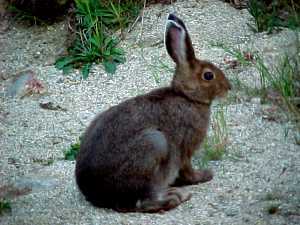 The wilderness nature of the area requires careful provisioning and planning. The best launch ramp we could locate, Sprague Creek, is above Mica Dam, thirteen km past the dam and past Potlatch Campground on a gravel road. It can apparently be used at "any higher water level" and vehicles can be left there at the ramp while cruising. 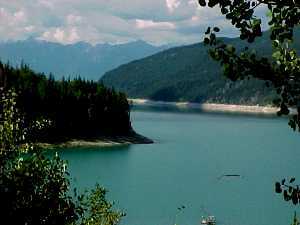 The dam is about 90 miles north of the town of Revelstoke, so boat and tow vehicles should be topped off with fuel before heading north. 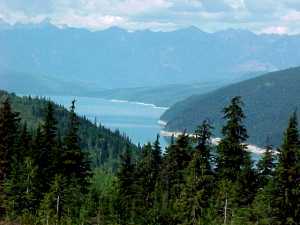 -----The next lake down the Columbia is Lake Revelstoke, which extends 130 km from Revelstoke Dam, to the tailrace of Mica Dam. 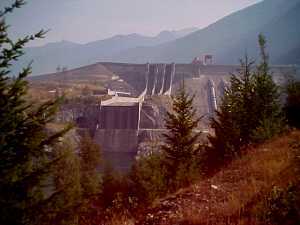 Revelstoke Dam is 400 feet high and has an interesting tour and visitor center. -----This is an easy lake for access and boating. There is a good launch ramp and camping place near the lower end of the lake, Martha Provincial Park. Long-term parking is possible at the ramp with the permission of the park caretakers. -----We camped at the Park through Labour Day weekend and found it to be a scenic and beautiful place. 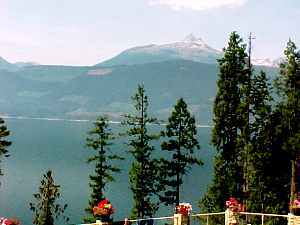 The lake is scenic, sandwiched between high mountains. Perhaps the most awesome part of the lake is immediately north of the old gold town of Downie, where the river is pressed tightly by high banks. -----Ian is a mountain climber and guide. 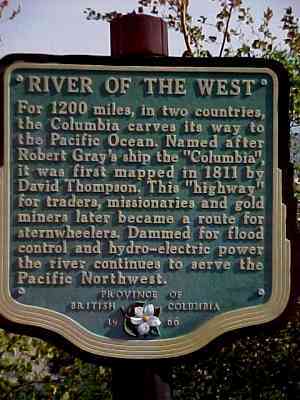 We met him on his sailboat at the site of Downie, the Gold Rush town just below where the Goldstream River joins the Columbia. He had the rugged build of a mountaineer, but he coughed when he talked to us. "It's the forest fire smoke - got my lungs. Hard to breath. We used to carry shorter ropes, but now we've all switched to 80' lengths. Too much exertion and heavy breathing to carry them at high altitude through the smoke. Had to stop climbing, so now I'm on the boat awhile." -----We asked Ian for his recommendation for cruising on the upper three lakes of the Columbia System. "Well, Kinbasket is wilderness and beautiful - but it's isolated and there's no fuel or supplies. Revelstoke is great, especially the Narrows up river from here. But … to let you in on a little secret … the real gem is the lower half of the Arrow Lake. There's no road down there, so it's wilderness. The mountains are marvelous seen from the lake. Access is easy and you can get supplies and fuel. 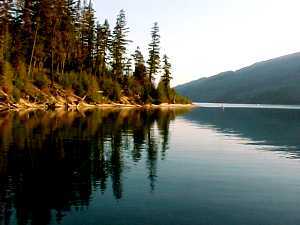 If you do no other, cruise the southern half of Arrow Lake." 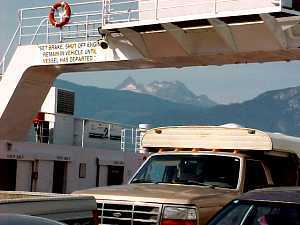 ----- We drove as much of the shore of Arrow Lake as possible, and took the Shelter Bay ferry. 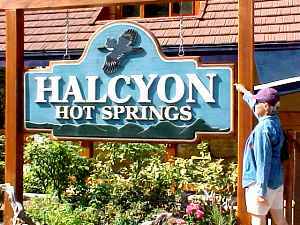 -----We obviously had to stop and savor the delights of the Halcyon Hot Springs Resort. The restaurant was great, the hot springs and swimming pools excellent, and the folks there are good hosts. We recommend a visit, and they have a small, somewhat marginal dock, they plan to improve in the near future. -----Ian is correct - even the northern part we could see is a real gem. Since Ian had suggested the best boating to be the southern portion, we checked out the Boat Ramp at Syringa Creek Provincial Park. It is inadequate, being too short for our trailer and lacking a dock for loading. We found, just south of the Park and north of the Hugh Keenleyside Dam, Syringa Park Marina, a private boat launch and marina. They have a fine ramp and good docks. Launching from this facility would put all the most scenic part of the lake within easy cruising. 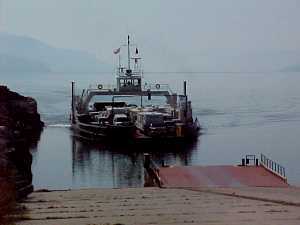 To continue cruising farther north, there is refueling at the dock at Nakusp. 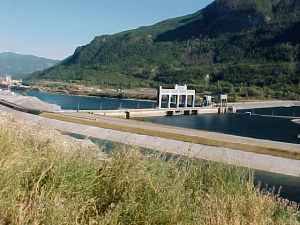 -----The Keenleyside Dam has a lock, primarily to facilitate log rafts from Arrow Lakes to the mill at Castlegar. -----There is considerable current and shoal below the dam, however, and one would want to cruise south from the dam with caution. It would be delightful in a canoe, kayak, or even a dinghy with care. 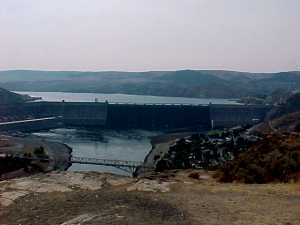 -----Grand Coulee Dam is the next dam down the Columbia, and the first US dam encountered in a down river journey. 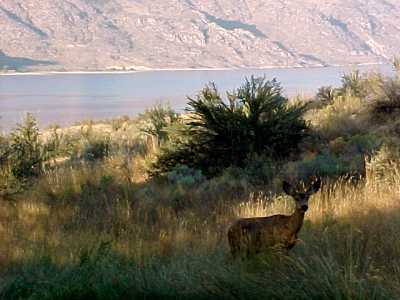 -----It backs up Lake Roosevelt for over 135 miles, virtually to the Border. 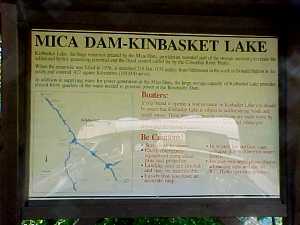 -----There are twenty-three public boat ramps for access into the lake and thirty-seven camp areas. Information is easily available on the lake and boating/camping. 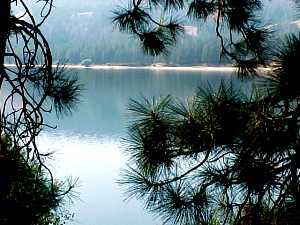 -----The campground, marina and boat launch at Kettle Falls, near river mile 105, is excellent and would be our preferred launch site for long-distance cruising from the upper part of the lake. Spring Canyon Ramp is equally good for access to the lower part of the lake. Roosevelt Lake offers great desert cruising, with abundant wildlife, laser shows on the dam, Native American museums, and steam boating history. 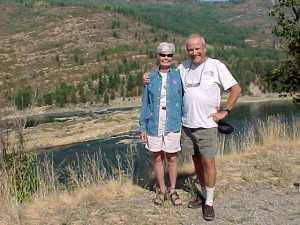 -----Next summer, if all goes well, we intend a cruise down the upper Columbia River. Unless, that is, my Dionysian partner spontaneously comes up with another great idea before then.